With apologies for the stretch it took to relate this to pottery history. Never underestimate family reunions. These rare chances to revel in the past can lead down unexpected paths. Case in point, Van Meter, IA (current population: 1094). U.G. Griffith was returning home around 1am one night in October 1903 when he saw a light on the bank roof. He approached thinking it might be thieves. The light darted to another rooftop and disappeared. The next night, again around 1am, O.V. White, who slept above his hardware store near the bank, was woken by a light shining in his face. He fired five shots point blank into the hulking figure hovering over him. O.V. was known for his dead aim, but the creature ran off without leaving a trace. A posse formed. They tracked the Visitor to an abandoned coal mine. It sprang out, followed by several juveniles of it’s kind. The creatures flew off into the cornfields, shrieking, never to be seen again. For anyone wondering how on earth this tale might relate to pottery history, unfortunately it doesn’t. It’s just too bizarre not to mention. 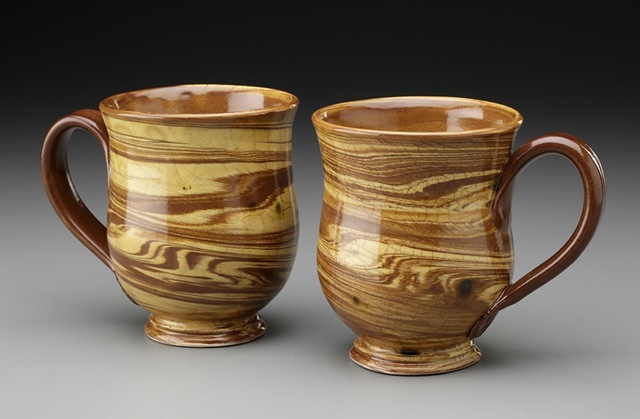 The best that can be done is to end with a John Polak photograph of some mugs I made recently. The Van Meter Visitor: A True and Mysterious Encounter with the Unknown. Chad Lewis, Noah Voss and Kevin Nelson. On The Road Publications. 2013. You are currently browsing the This Day in Pottery History blog archives for October, 2013.